The Treasury Department's counterterrorism arm is investigating speaking fees paid to a long-time Democratic Party leader who is among the most vocal advocates of an Iranian opposition group designated as a terrorist group by the State Department. Former Pennsylvania Gov. Edward G. Rendell told The Washington Times that Treasury investigators last week subpoenaed records related to payments he has accepted in exchange for public speaking engagements. Mr. Rendell is among a bipartisan group of prominent former officials - including Cabinet-level Republicans - who have accepted payment in exchange for speeches calling for the removal of the Mujahideen-e Khalq (MEK) from the State Department's list of Foreign Terrorist Organizations. 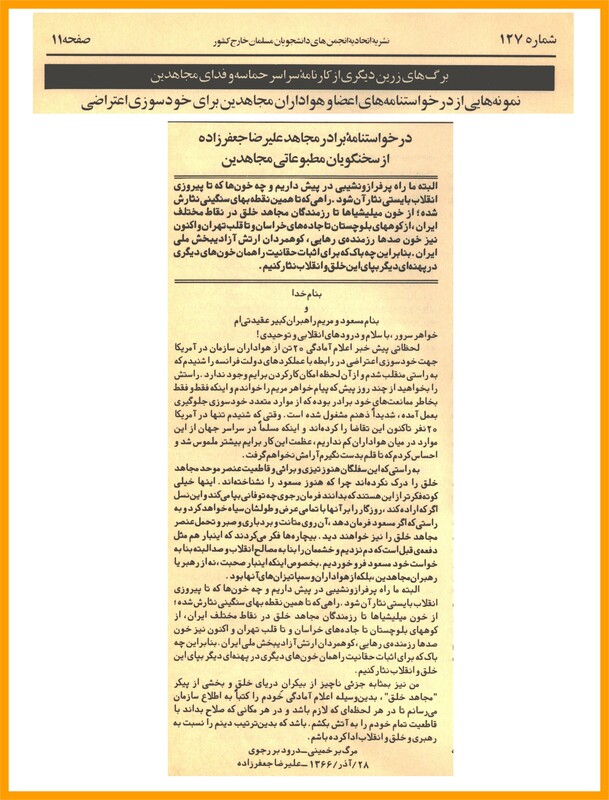 The MEK, also known as the People's Mujahedin of Iran, has long called for the overthrow of the Islamic theocracy in Tehran. The group, which engaged in terror attacks on Iranian government targets in the 1980s, has been on the terrorist list since 1997, when President Bill Clinton put it there in an attempt to improve relations with Iran. Mr. Rendell and others argue the MEK should be removed from the list because it has not engaged in violence in more than two decades and shares a common enemy with the United States. While support for their position is widespread in Washington, some observers have raised questions about the legality of accepting payment in exchange for providing assistance or services to a listed terror group. Mr. Rendell, who asserts that he has done nothing illegal, said that on Feb. 29 the Treasury Department's Office of Foreign Assets Control issued a subpoena seeking "transactional records about what payments we received for speaking fees." The subpoena was sent to the office of Thomas McGuire, an attorney with the Los Angeles-based talent agency William Morris Endeavor Entertainment, which handles all of Mr. Rendell's speaking engagements, including those in which he has advocated on behalf of the MEK. Calls to Mr. McGuire on Friday were not immediately returned. A Treasury Department spokesman on Friday refused to confirm or deny the subpoena's issuance, saying the department "does not comment on possible investigations." "But the MEK is a designated terrorist group, therefore U.S. persons are generally prohibited from engaging in transactions with or providing services to this group," the spokesman said. Designated terrorist groups are subject to sanctions and the spokesman, added that "the Treasury Department takes sanctions enforcement seriously and routinely investigates potential violations of sanctions laws." Mr. Rendell said the subpoena sent to his agent seeks information "about any emails, any letters, any communications involving payment that we've received or sent back." "We're absolutely cooperating 100 percent," he said. "I've instructed my agent not to hold back on any emails or any documents. There's nothing to hide." Mr. Rendell, who once served as general chairman of the Democratic National Committee, is apparently the only person to be subpoenaed among a group of nearly two-dozen high-level political figures who have grown increasingly vocal in their calls for the MEK's removal from the terrorist list. The group includes Democrats such as former Vermont Governor Howard Dean and high-profile Republicans such as former Homeland Security Secretary Tom Ridge and former Attorney General Michael B. Mukasey. At issue is the fate of 3,400 Iranian dissidents said to be members of the MEK. They have been living in Iraq since the Iran-Iraq war during the 1980s when they fought on the Iraqi side. Since the U.S. occupation of Iraq in 2003, the MEK supporters lived under U.S. protection at a camp on the Iranian border. But now the Americans have left, the Iraqi government has said it will close the camp. The supporters fear they will be departed to torture and death in Iran, but third countries are unwilling to take them because of the group's designation on the Foreign Terrorist Organization list overseen by the State Department. The group has sued the State Department in federal court to be taken off the list, but the case has dragged on for more than two years. Last week, a court ruled that the State Department must respond to the MEK petition by March 26. The European Union removed the group from its terror list in 2009. David Cole, a professor at the Georgetown University Law Center, noted that "any group that's on the list is also, by definition, on the Treasury Department's list for specially designated global terrorists." While Mr. Cole stressed his personal belief that individuals have a "First Amendment right to speak out freely" for an organization like the MEK, he said that "it is a crime to engage in any transaction, which would certainly include getting paid to do public relations for them." Mr. Rendell and Mr. Ridge acknowledged to The Times this week that they have accepted payment in exchange for making media appearances and speeches calling for the MEK's removal from the terrorist list. And both men defended their actions. "I've been in politics 34 years, and I can tell you right now that I would not jeopardize my reputation for any amount of money," said Mr. Rendell. "I did my research extensively on this issue before I ever agreed to speak on it, and I am 100 percent convinced that the MEK shouldn't be on the Foreign Terrorist Organization list." As to the extent to which accepting payments for such advocacy may or may not be legal, Mr. Ridge said it is a "moot question." "Assuming there may be a question, and we don't think there is, the bigger question is: Does the MEK belong on the list?" he said. "It's kind of curious that those who don't like our advocacy are suggesting that we might be doing something wrong." Neither man would specify how much he has been paid for his speeches, although Mr. Rendell, who has traveled to Paris and Geneva five times to attend conferences calling for the MEK's removal from the terrorist list, said that in addition to receiving a "substantial speaking fee," his expenses have been covered in full. A source familiar with the payments said told The Times that a public figure of Mr. Rendell's stature receives "in the ballpark" of $20,000 per speaking appearance. But where the money actually comes from is unclear. Mr. Rendell said payments for his speeches come from "money from citizens, both American citizens here and Iranian expats in Europe who believe in the cause." He stressed that he never directly accepts speaking fees, which are handled by his agent at William Morris. Mr. Ridge, who has not been issued a subpoena from the Treasury Department, said he believes the money comes from legitimate sources but that he was not sure what they are. "It is my understanding that there is a very large diaspora of Iranian Americans, and the diaspora is international obviously," he said. "There's a very significant group of American citizens and how they pledge their money and send it in and aggregate it to pay us, I don't know." Trita Parsi, who heads the National Iranian America Council, argues that the money is connected to the MEK. "Everyone on Capital Hill knows that, once on the terrorist list, the MEK could no longer lobby under their own name, so they created organizations with the same individuals and used those organizations, which are not on the terrorist list, to do the lobbying," said Mr. Parsi. "That includes giving money to U.S. officials to speak on their behalf and speak in support of the MEK while pretending that the money is not coming from the MEK." The website of the National Iranian American Council maintains a list of groups it claims are raising money for the MEK, and Mr. Parsi claims that officials from the State Department have privately told him that the MEK sets up "shell organizations" to raise money. When asked about Mr. Parsi's claim Friday, a State Department spokesman declined to comment. • Shaun Waterman contributed to this report. Last Thursday, NBC News reported that the Mujahedeen-e Khalq (MEK), an exiled Iranian opposition group designated a “foreign terrorist organization” by the State Department, conducted a series of assassinations of Iranian nuclear scientists. Former CIA official and visiting Georgetown professor Paul Pillar, citing the U.S. government’s definition of terrorism, observed that “with or without confirmation of details of this story, the assassinations are terrorism.” But numerous right-wing pundits and politicians here in the United States — many of whom regularly decry the use of terrorism as a means to political ends — have celebrated the MEK’s alleged attacks. Appearing on Fox News on Sunday, former New York mayor Rudy Giuliani declared that the MEK should be the Time Magazine “person of the year” if they were behind assassinations of Iranian nuclear scientists. Let’s be frank: Were the MeK to play the critical role in derailing an Iranian bomb, it would be far more deserving of a Nobel Peace Prize than a certain president of the United States we could mention. To those who say it is immoral to use those who have employed terrorism, the only reply can be that it would be far worse for Israel’s government to allow such scruples to prevent them from carrying out actions that might stop the Iranians from going nuclear. Noticeably, the MEK’s defenders chose not to address the NBC report’s other major disclosure. 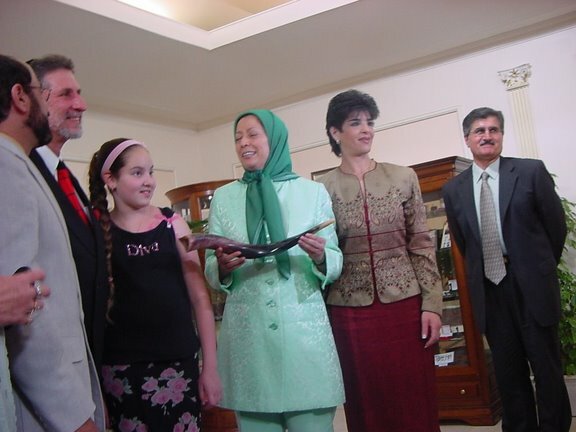 The MEK reportedly worked with Ramzi Yousef, the terrorist behind the first attack on the World Trade Center, to bomb an Iranian shrine, killing at least 26 people. 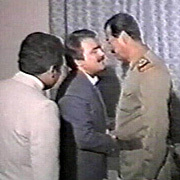 The NBC report did not go on to substantiate any direct links between the Israeli government and the assassination campaign, and the MEK denied any involvement in the attacks. State Departmemt: It is unlawful to provide support to listed terrorists! The Bureau of Counterterrorism in the State Department (S/CT) continually monitors the activities of terrorist groups active around the world to identify potential targets for designation. When reviewing potential targets, S/CT looks not only at the actual terrorist attacks that a group has carried out, but also at whether the group has engaged in planning and preparations for possible future acts of terrorism or retains the capability and intent to carry out such acts. Once a target is identified, S/CT prepares a detailed "administrative record," which is a compilation of information, typically including both classified and open sources information, demonstrating that the statutory criteria for designation have been satisfied. If the Secretary of State, in consultation with the Attorney General and the Secretary of the Treasury, decides to make the designation, Congress is notified of the Secretary’s intent to designate the organization and given seven days to review the designation, as the INA requires. Upon the expiration of the seven-day waiting period and in the absence of Congressional action to block the designation, notice of the designation is published in the Federal Register, at which point the designation takes effect. By law an organization designated as an FTO may seek judicial review of the designation in the United States Court of Appeals for the District of Columbia Circuit not later than 30 days after the designation is published in the Federal Register. Until recently the INA provided that FTOs must be redesignated every 2 years or the designation would lapse. Under the Intelligence Reform and Terrorism Prevention Act of 2004 (IRTPA), however, the redesignation requirement was replaced by certain review and revocation procedures. IRTPA provides that an FTO may file a petition for revocation 2 years after its designation date (or in the case of redesignated FTOs, its most recent redesignation date) or 2 years after the determination date on its most recent petition for revocation. In order to provide a basis for revocation, the petitioning FTO must provide evidence that the circumstances forming the basis for the designation are sufficiently different as to warrant revocation. If no such review has been conducted during a 5 year period with respect to a designation, then the Secretary of State is required to review the designation to determine whether revocation would be appropriate. In addition, the Secretary of State may at any time revoke a designation upon a finding that the circumstances forming the basis for the designation have changed in such a manner as to warrant revocation, or that the national security of the United States warrants a revocation. The same procedural requirements apply to revocations made by the Secretary of State as apply to designations. A designation may be revoked by an Act of Congress, or set aside by a Court order. The organization must engage in terrorist activity, as defined in section 212 (a)(3)(B) of the INA (8 U.S.C. § 1182(a)(3)(B)),* or terrorism, as defined in section 140(d)(2) of the Foreign Relations Authorization Act, Fiscal Years 1988 and 1989 (22 U.S.C. § 2656f(d)(2)),** or retain the capability and intent to engage in terrorist activity or terrorism. Supports our efforts to curb terrorism financing and to encourage other nations to do the same. Signals to other governments our concern about named organizations. January 12, 2012 - While the fifth and latest assassination of an Iranian scientist in broad daylight has Iran pointing the finger at Israel and the United States, with at least the US State Department denying any involvement, there is no evidence yet to determine exactly who was behind the attack. However, the US State Department complicated what would have otherwise been plausibly denied, by claiming no US involvement "in any kind of act of violence inside Iran." This is a verified lie. The US has indeed conspired to carry out a campaign of covert violence against Iran and is on record already beginning operations against the Islamic Republic even before Obama came into office. 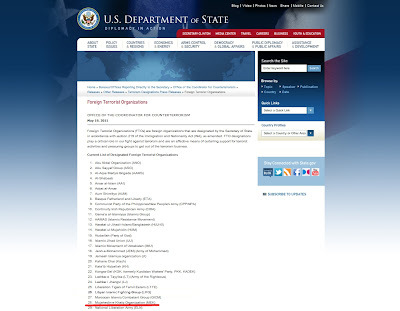 These operations have continued up until present day with the US harboring, arming, funding, training, and providing diplomatic support for a US State Dapartment listed "foreign terrorist organization," the Mujahedeen e-Khalq (MEK). Image: US State Department lists MEK as a "Foreign Terrorist Organization." This page has since been taken down and replaced with this .pdf list. Who Is MEK and Why is the US Funding Terror? It should be noted that both the Brookings Institution and the RAND Corporation note that Iran, even upon possessing nuclear weapons is unlikely to use them or proliferate them to non-state actors. This is based on observations made of Iran's long standing chemical and biological arsenals that have been under strict control for decades. There is also recognition of the fact, that despite the propaganda found throughout the corporate-media, Iran does indeed value self-preservation and conducts its foreign-policy aggressively but not irrationally. The real danger of Iran's possession of nuclear weapons, as stated by the Brookings Institution (page 24 & 25), is that they may attempt to then subvert American allies and emboldened by the inability for the US to retaliate, allow them to overturn the Middle Eastern status quo, as currently dictated by Wall Street and London. In other words, it is not American or Israeli national security that is at risk, but rather their unchecked and unwarranted hegemony throughout the region. It then seems that US support for MEK becomes all the more indefensible when one realizes it is for extraterritorial hegemony, not national security that America is sponsoring bonafide terrorists. 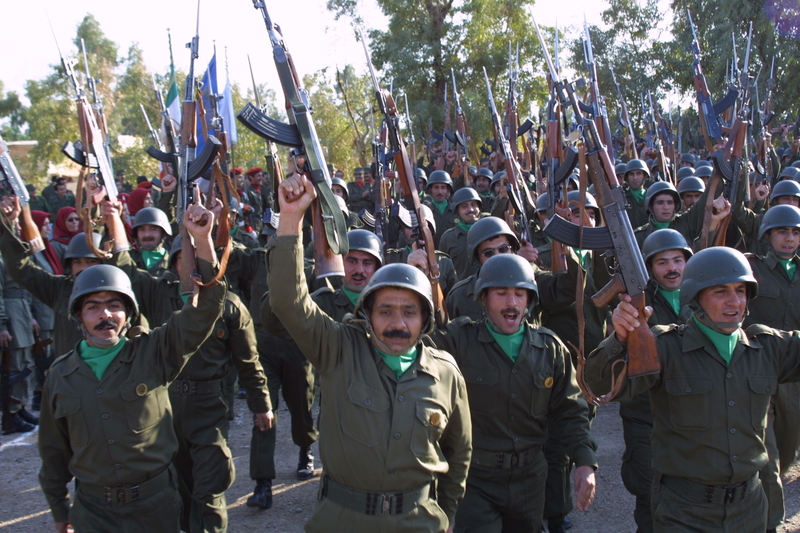 Incredibly, US forces in Iraq had provided MEK's main camp with security, and with the recent "withdrawal" of US troops from Iraq, the US State Department and even the UN have been scrambling to find a new safe haven for the US listed terrorist organization. Even more unimaginable is the fact that many of the foremost fearmongers and proponents of the "War on Terror" are engaged in desperate lobbying efforts to get MEK delisted. 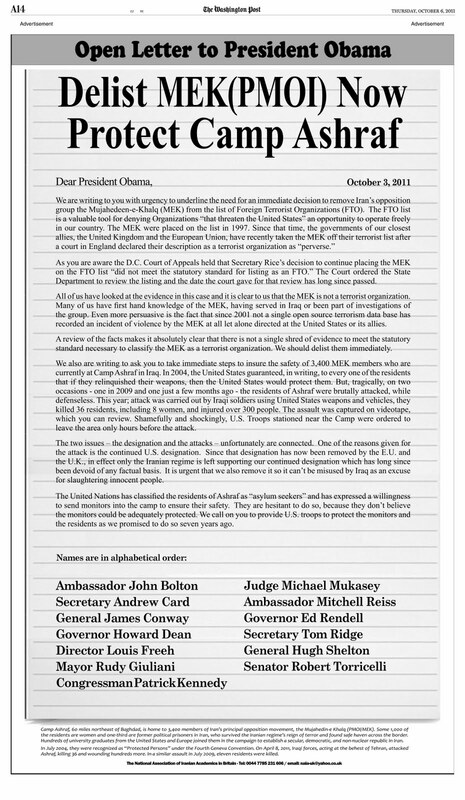 In October of 2011, a full page ad was taken out in the Washington Post on MEK's behalf. 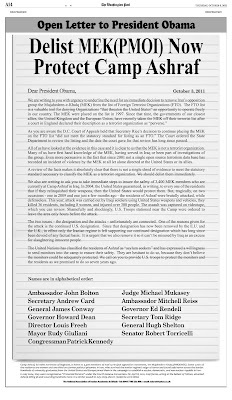 Among those signing the statement made in the ad were John Bolton, Howard Dean, Rudy Giuliani, Ed Rendell, and Tom Ridge. When reading the statement, it must be kept in mind that the Brookings Institution already confirmed that MEK was a terrorist organization and that it had verifiably killed US military personal and civilians. Also keep in mind that Brookings admitted that MEK's targets in Iran included political and civilian targets. With MEK's specialty being among other things, assassinations, they are also likely suspects behind the recent spat of targeted killings of Iranian scientists. The Brookings Institution report, "Which Path to Persia?" confirms that indeed US policy makers have conspired to use MEK as an armed-proxy to commit acts of violence inside Iran, while Seymour Hersh's 2008 New Yorker article "Preparing the Battlefield confirmed that MEK had already begun receiving weapons, training, and financing to begin their campaign. Foreign Policy's most recent article, "State Department scrambling to move the MEK -- to a former U.S. military base? 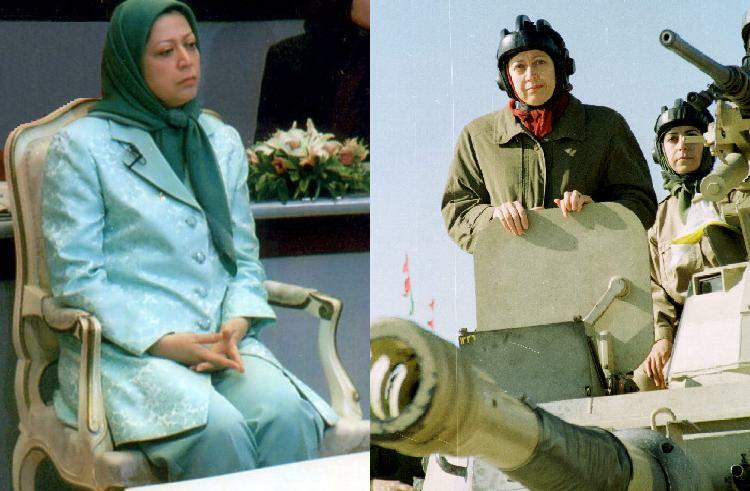 "confirms that MEK is still receiving considerable support from the US to this very day. The US State Department's recent claim that it is not involved "in any kind of act of violence inside Iran," is clearly false. The US is committing acts of violence inside of Iran to the extent of using not only special forces as noted by Hersh's 2008 article, but also by using terrorists with a long history of attacking political and civilian targets in Iran.